4. And Cat Ba Island in Hai Phong City being far 160 kilometers from Hanoi to the East. But there will be a huge omission if I don’t mention about Ha Long Bay. Well, I’ve gone to there several times a year. There are not only millions of foreign tourist around the world but also Vietnamese people, specially people in the south and middle of Vietnam also desire once arriving this heritage. I’ve mentioned the word “Heritage” because it not only is a "special present" that natural gives to Vietnam but also have been recognized two times as World Natural Heritage by UNESCO. If you read somewhere on the famous website, many people said that Trang An- Hoa Lu (in Ninh Binh Province) is "Ha Long Bay on land", so Ha Long Bay is really a bay on the sea which including thousands of mini - islands, large and small mountains heaving on the bay. And I may not need to describe much about this, I think you have to research carefully when you want to visit Halong Bay to view firsthand rare natural heritage. In this short article, I just want to guide some my experience and supply some important information for you to can help you making a journey to Ha Long Bay together with wonderful impression when you go to Hanoi, Vietnam. 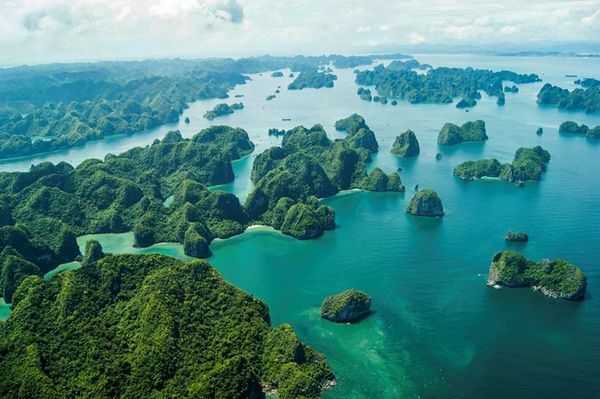 Ha Long Bay is located far 155 kilometers from Hanoi to the Northeast. Ha Long is also name of city being near romantic Ha Long Bay. Ha Long means that dragon landed and Hanoi has old name as Thang Long, it means dragon fly high. There are many roads to move from Hanoi to Ha Long Bay. And similarly, you also use many vehicles to get to this place. From Hanoi center, you go to Chuong Duong Bridge or Vinh Tuy Bridge (both of them span Red River) then overlooking Highway No.5 (Hanoi to Hai Phong City). 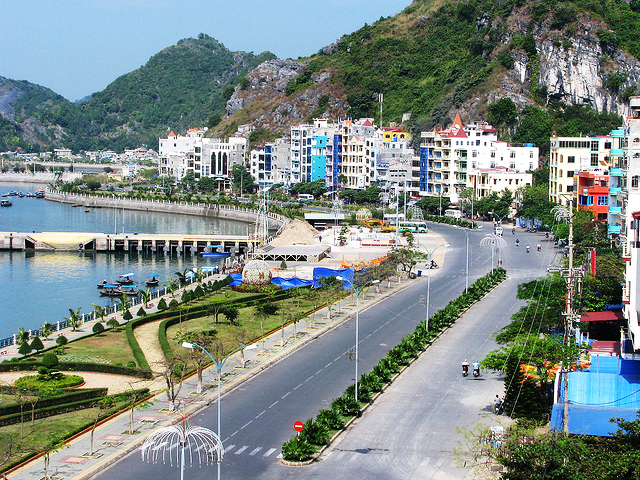 However, you have to turn onto Highway No.1A (it is North- South Expressway of Vietnam) to Lang Son Province, but when you go to Bac Ninh Province (30km from Hanoi), you must turn right to Highway No.18, this is the road linking between Noi Bai Airport and Ha Long Bay. And with me, there are 3 different routes to move from Hanoi to Ha Long Bay. 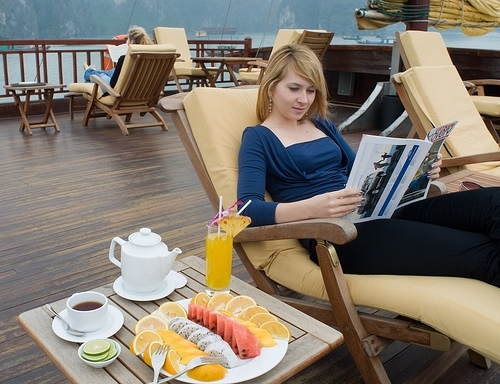 If you want to go to Ha Long Bay from Noi Bai International Airport, it is possible. When you go out of the airport gate, you call a taxi driving straight from Noi Bai to Ha Long on the Highway No.18 as I’ve just mentioned above. Total time is 2-3 hours. Taxi cost is about 10.000 VND/km accordingly, total cost is about 2.000.000 VND (equivalent to $90). If you want to go by bus, you should movie to My Dinh bus station which located in new urban area in the West of Hanoi. In this station, there are a lot of bus moving to Ha Long Bay from 7 AM to 10 P.M. Some times I (also as many people in Hanoi) use this vehicle. 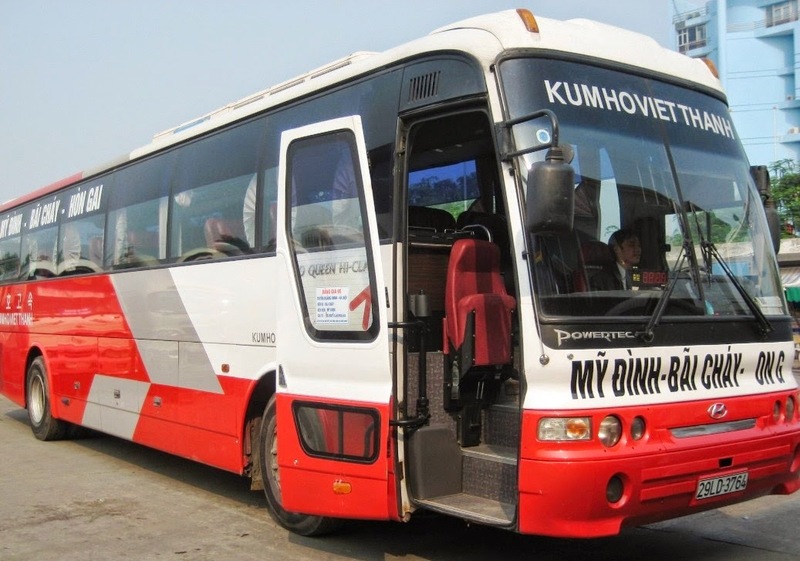 I usually choose Viet Thanh Bus, we used to call it is “Kumho” as bus brand to go to Ha Long Bay from My Dinh bus station in Hanoi. Because this bus has air condition and is cleaner than others, hostess are more enthusiastic. 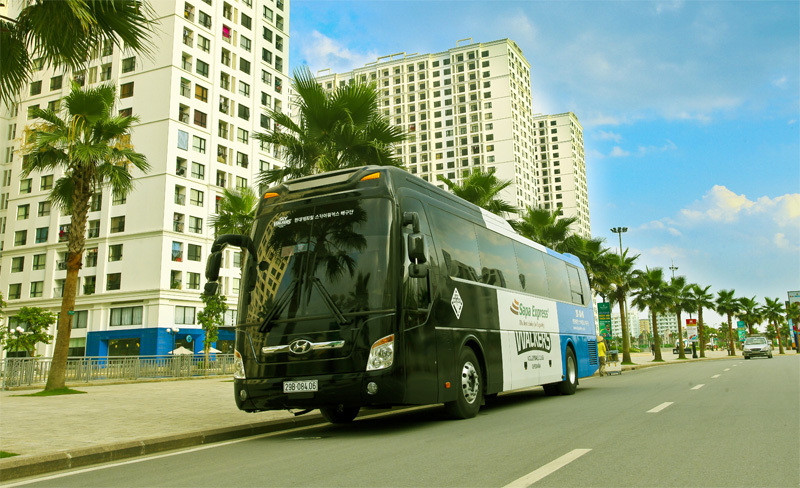 Bus route: My Dinh Bus Station - Thang Long Bridge (direction to Noi Bai International Airport), 3 kilometer from there, bus must turn right onto Highway No.18 to go straight to Ha Long. 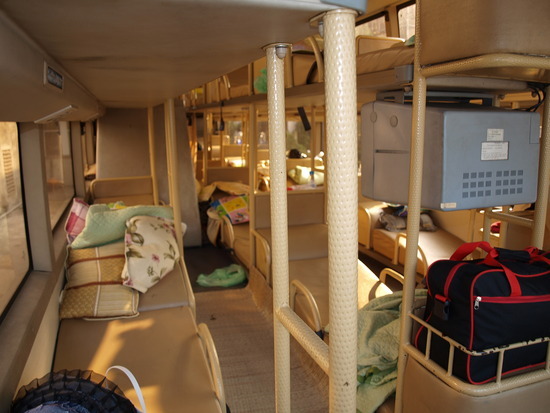 Minibus fare: 200.000 VND ($9). From Noi Bai airport, you can take the bus to My Dinh bus station. Then you continued take the bus from there to Ha Long if you don’t want to rent a taxi going straight from Noi Bai to Ha Long. On the internet, I met many tourists asking for information about trains from Hanoi to Ha Long and how to go, etc… In fact, there is no train from Hanoi to Ha Long. 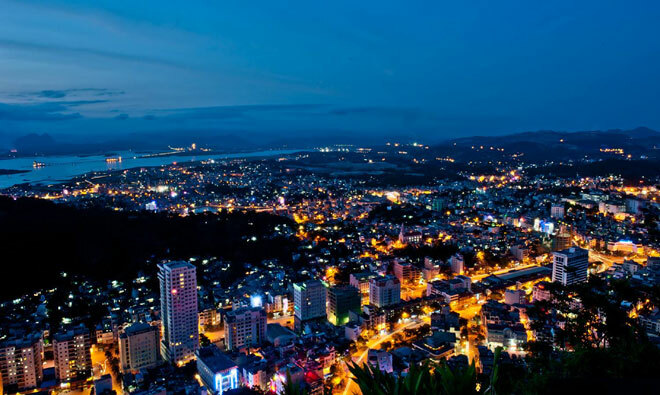 From Hanoi, there are just trains to Hai Phong, Lang Son, Lao Cai and North – South High-Speed Train. So, you won’t find any train to move from Hanoi to Ha Long. If you feel afraid and don’t want to move in the form of backpacker that I shared above, you should book a tour from Hanoi to Ha Long. In the old streets of Hanoi such as Ma May, Hang Bac, Ta Hien, there are many tour operators willing to serve the tour Hanoi - Ha Long Bay that you can choose them. If you need more information about Ha Long travel, you feel free to contact me.